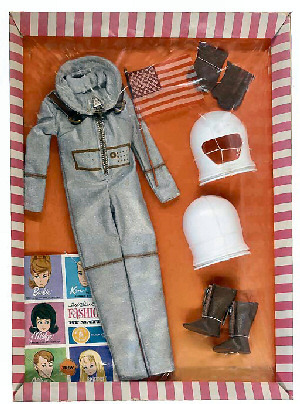 Barbie and Ken celebrated the excitement of the space program in 1965. Although Neil Armstrong did not take his famous first moon walk until 1969, 1965 saw many milestones in space exploration, including the first spacewalk and the first eight day mission. Barbie was not the first female astronaut - that was Russian cosmonaut Valentina Tereshkova, in 1963. I remember watching all of the space program firsts on our black and white TV. It was an exciting time in our history! 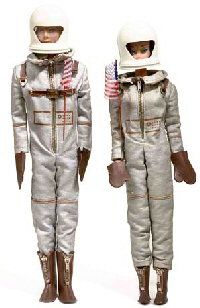 Mattel issued a Miss Astronaut Reproduction in 2010 for the Barbie Classic Careers / My Favorite Barbie Series.